as i previously mentioned, there are numerous recipes and dish prepared using peanut or groundnut, either used as a main ingredient or as a supporting ingredient. 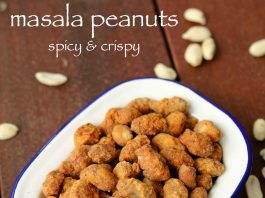 having said that, peanut masala is a simple snack prepared with peanut as the main ingredient. 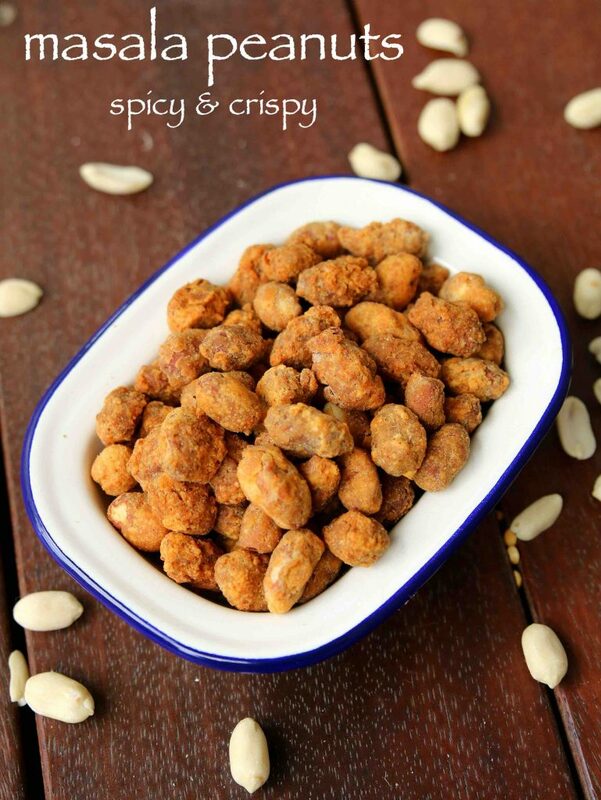 in other words, groundnut is coated with spiced chickpea, rice flour and corn flour coating which is later deep fried till it holds the crisp shape. i personally like this way of preparing masala groundnut, but there are other ways as well preparing it. the other popular way is to serve peanuts with onion and tomatoes topped with spice powder and lemon juice. it is also known as raja masala or raja special or masala kadlekayi. 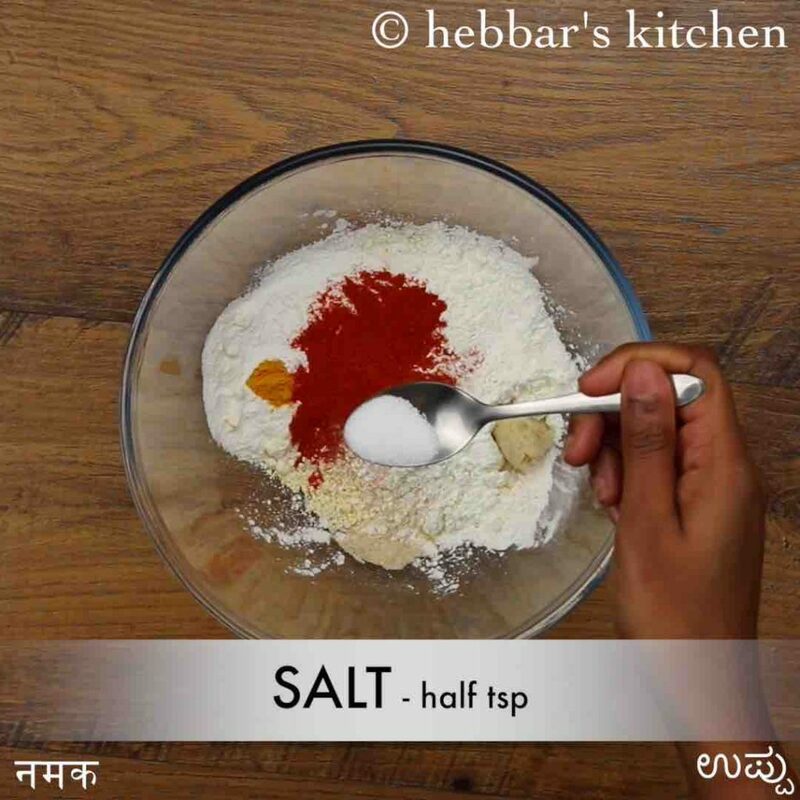 it is popular in karnataka and it is mainly served in restaurants as starters or appetisers. but this post mainly deals with coated masala groundnut recipe. 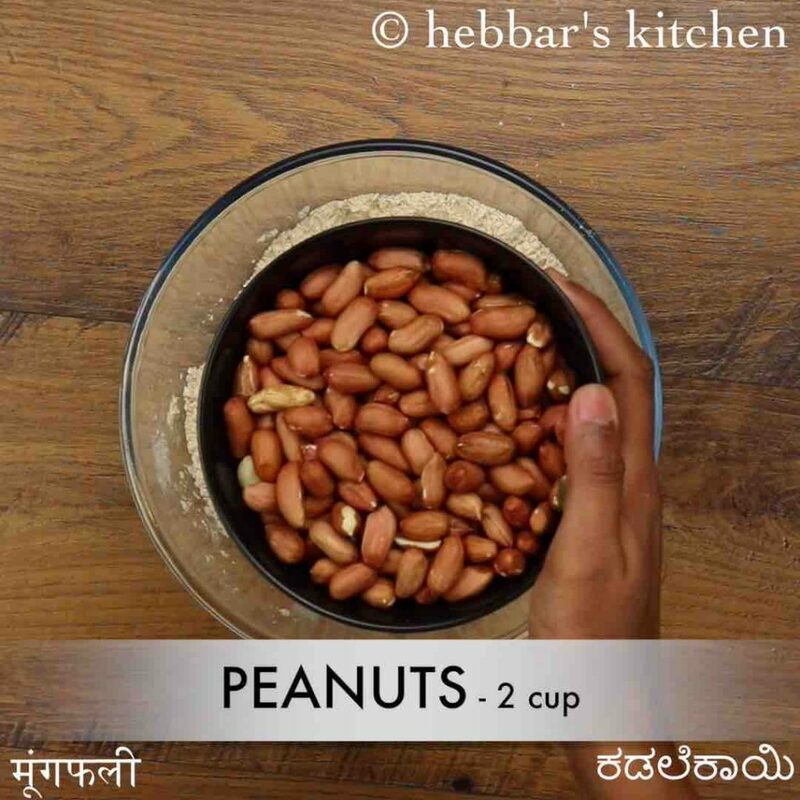 the recipe is extremely simple to prepare yet few tips and variation for this crisp and easy peanut masala recipe. 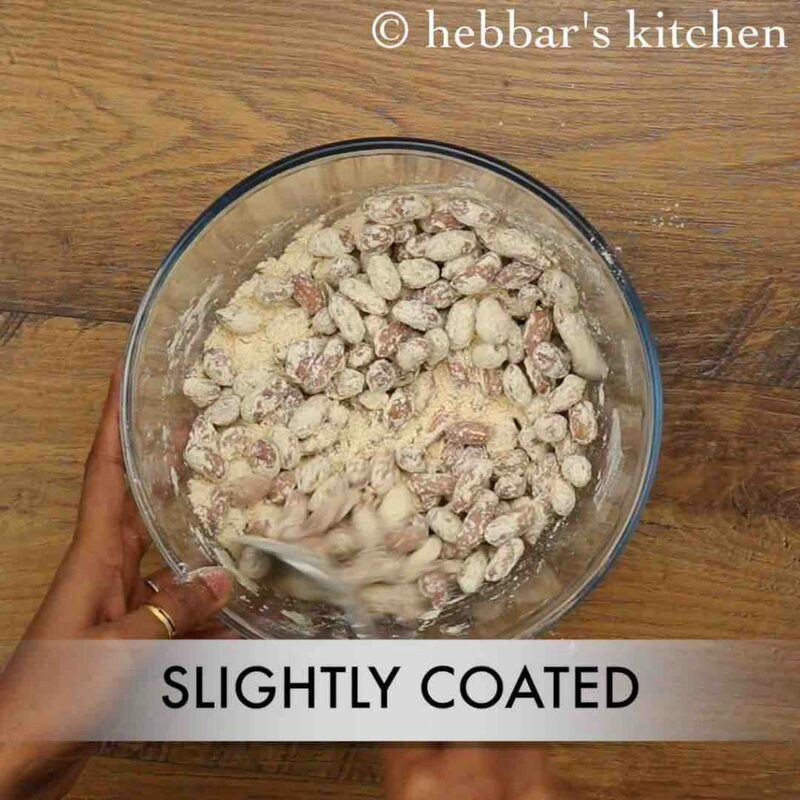 firstly, while preparing the spice coating using the flours, add the water in a small quantity so that it becomes a lump and stick to peanuts. we do not want a thin batter here and it has to be a thick paste. secondly, i have added baking soda to the spice coating which is not a mandatory option. and if you do not wish to add it can be ignored safely. also deep fry these peanuts in a low flame so that it gets cooked evenly. otherwise, the outer layer may get cooked faster with peanuts still raw at the inside. lastly, store these masala groundnuts in an airtight container for a better shelf life and remains fresh for a month. 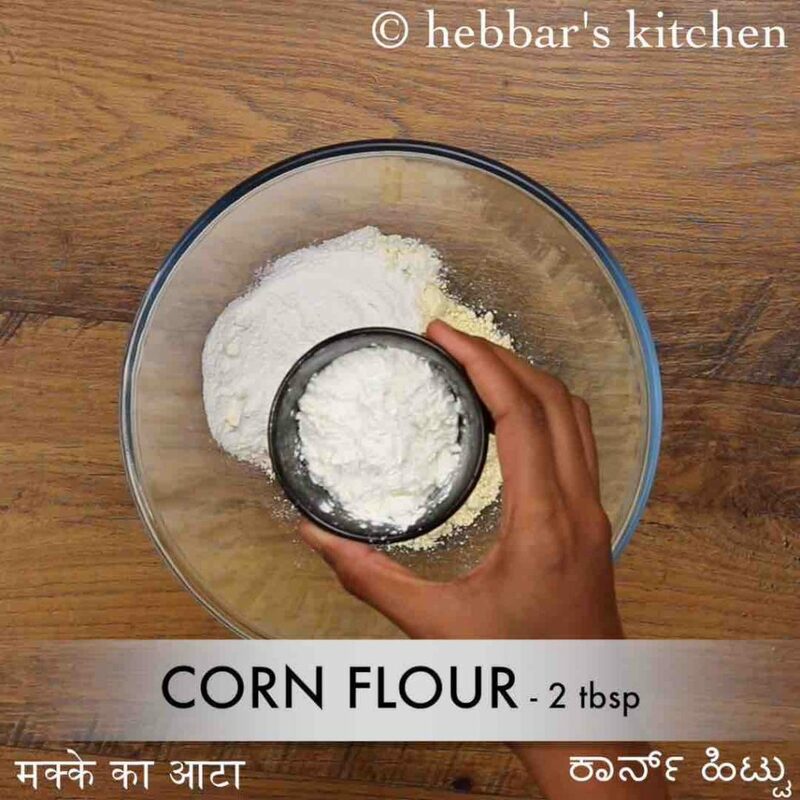 firstly, in a large mixing bowl take ½ cup besan, 2 tbsp rice flour and 2 tbsp corn flour. also add ¼ tsp turmeric, 1 tsp chilli powder, ½ tsp ginger garlic paste, pinch baking soda and ½ tsp salt. further, add 2 cup skinned peanuts and 2 tsp oil. 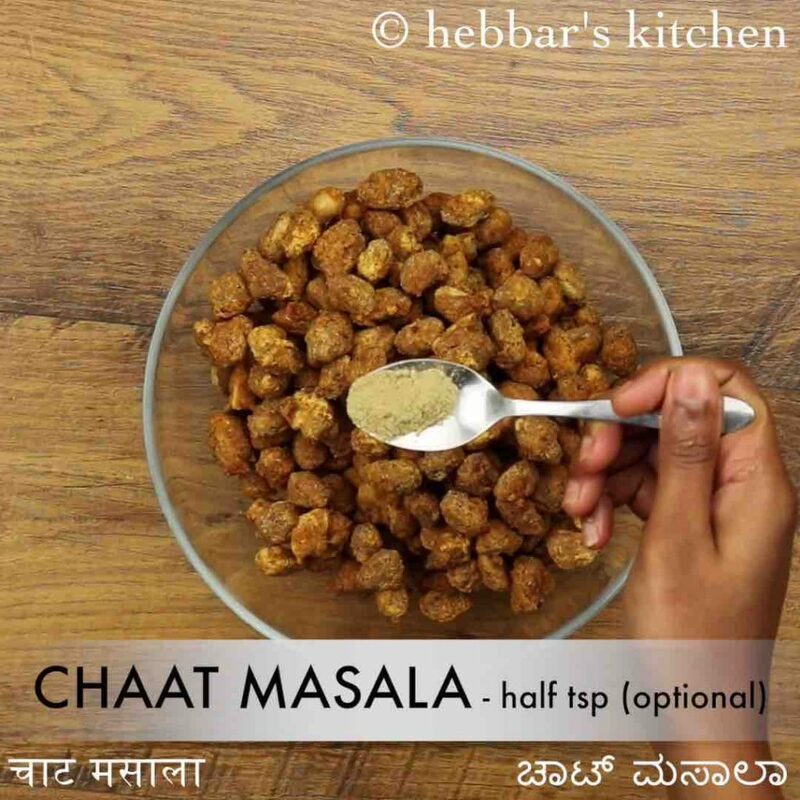 mix well, oil helps to coat peanuts with masala. further, add 2 tbsp of water and mix well. 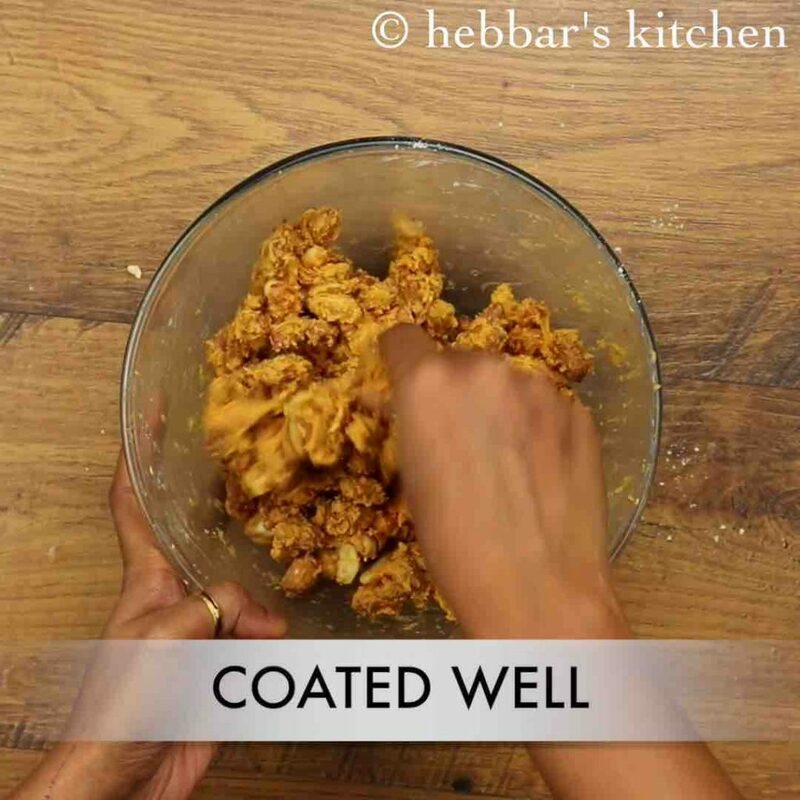 add 1-2 tbsp of more water in batches till the peanuts are coated well with besan. 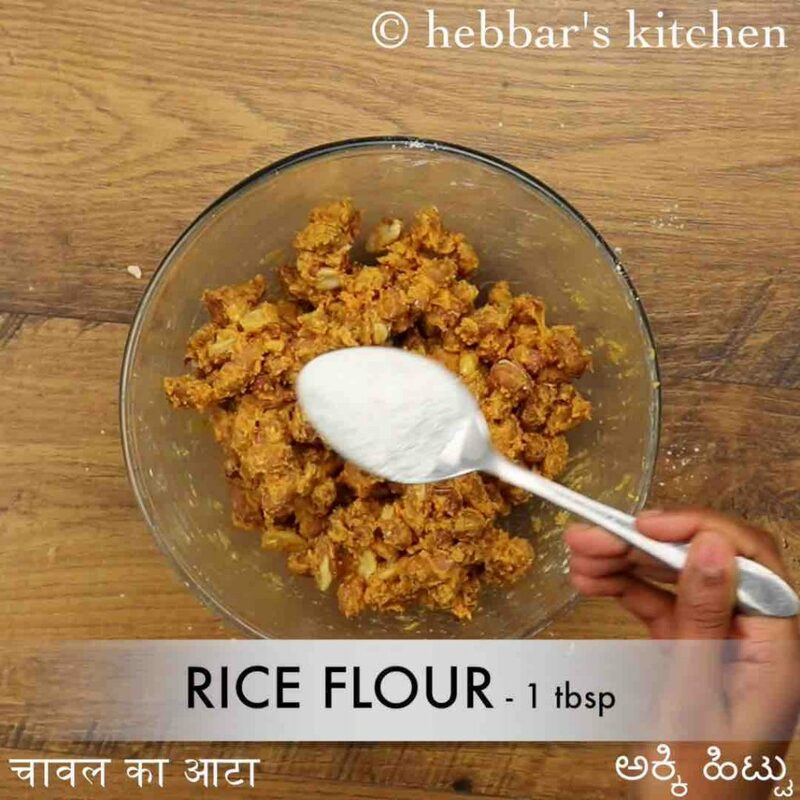 furthermore, add a tsp of rice flour and give a mix. this helps to separate peanuts. 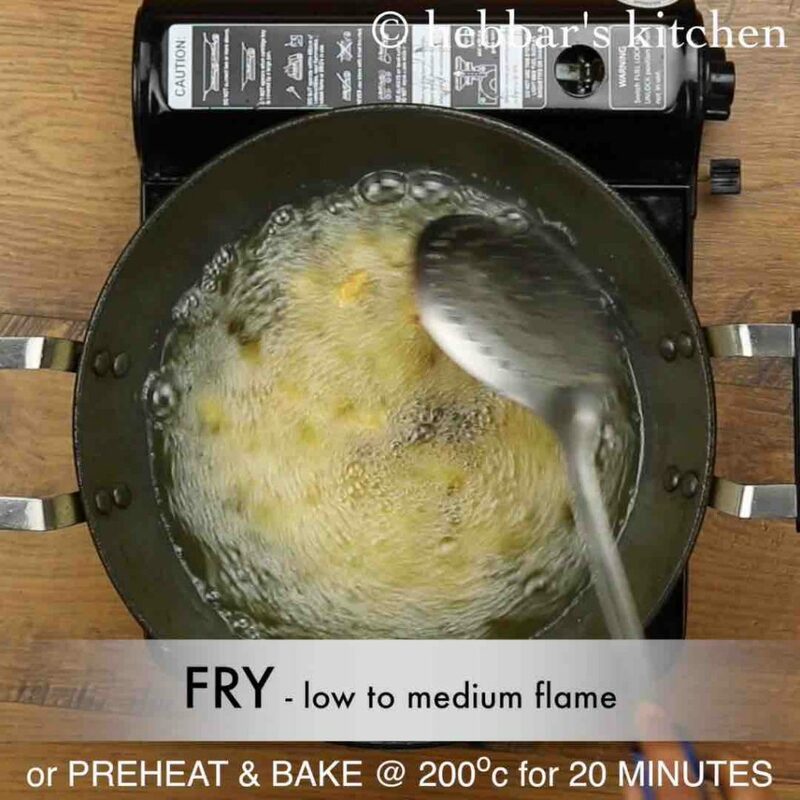 stir occasionally and fry on low to medium flame. sprinkle ¼ tsp chaat masala and mix well. this helps to enhance the flavour. 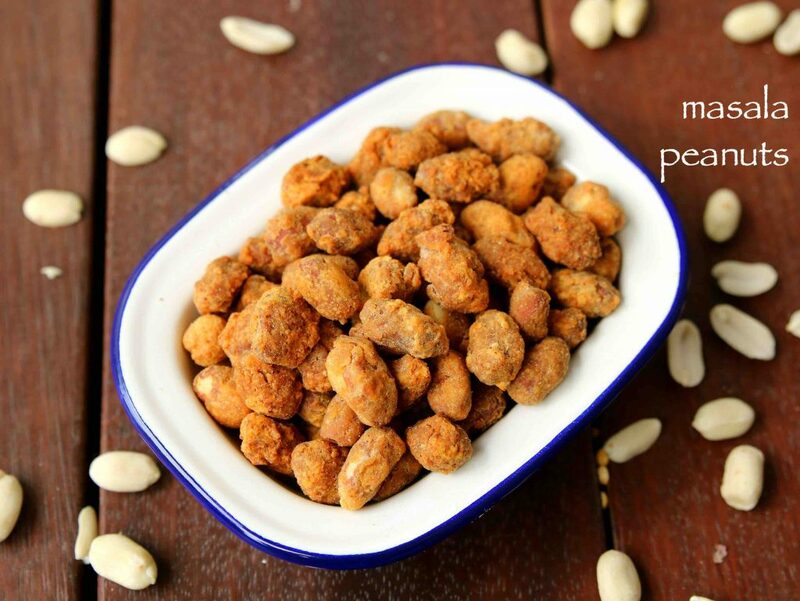 finally, enjoy crunchy masala peanuts or store in an airtight container for a month. 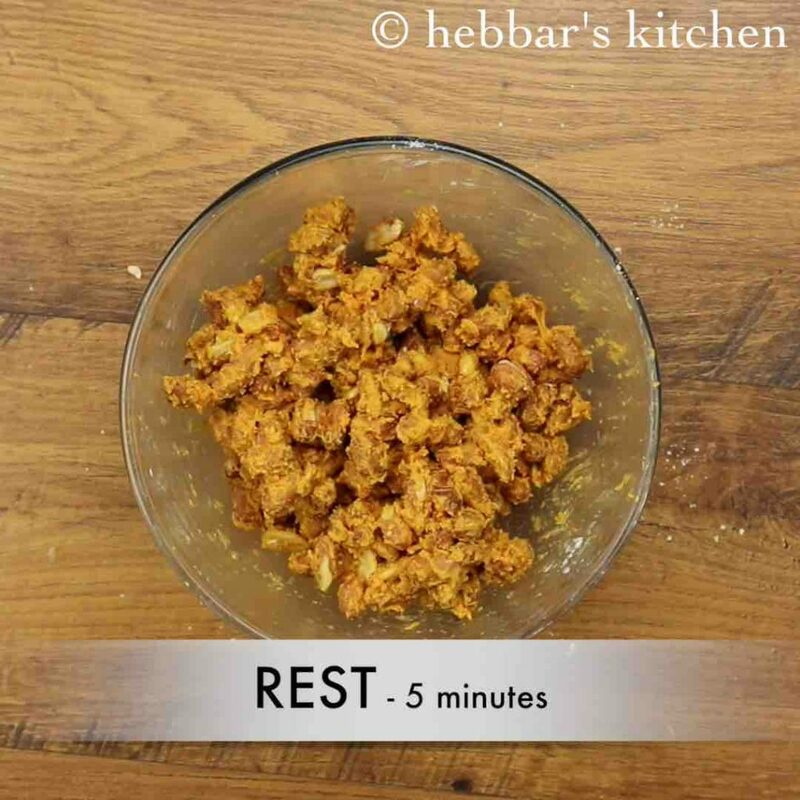 rest for 5 minutes making sure spices are absorbed well. 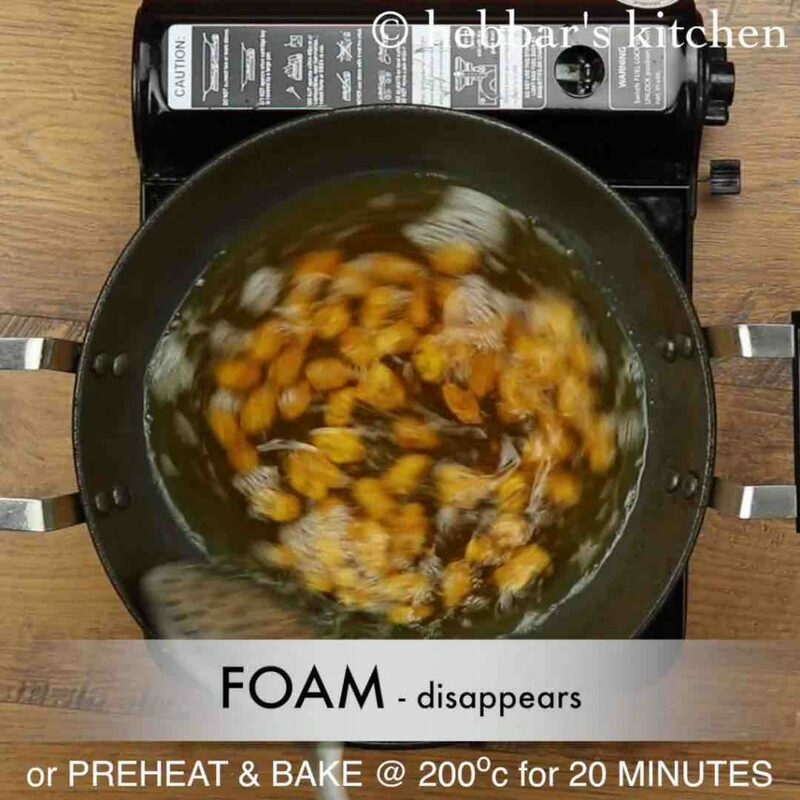 fry till the foams in oil disappears completely and peanuts turn golden and crisp. drain off the fried peanuts onto kitchen paper. 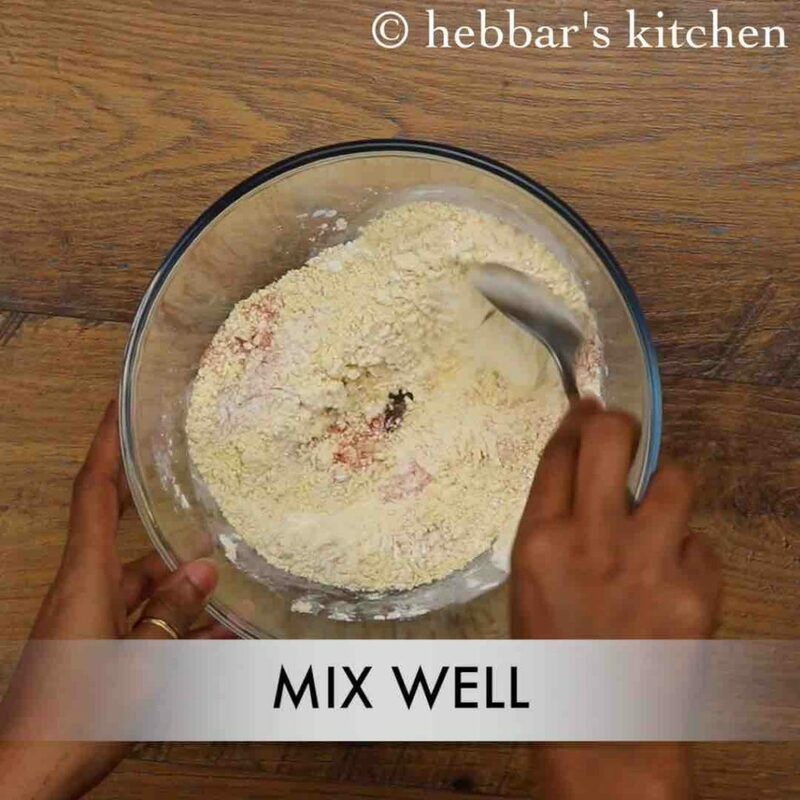 sprinkle ½ tsp chaat masala and mix well. this helps to enhance the flavour. finally, enjoy crunchy peanut masala or store in an airtight container for a month. 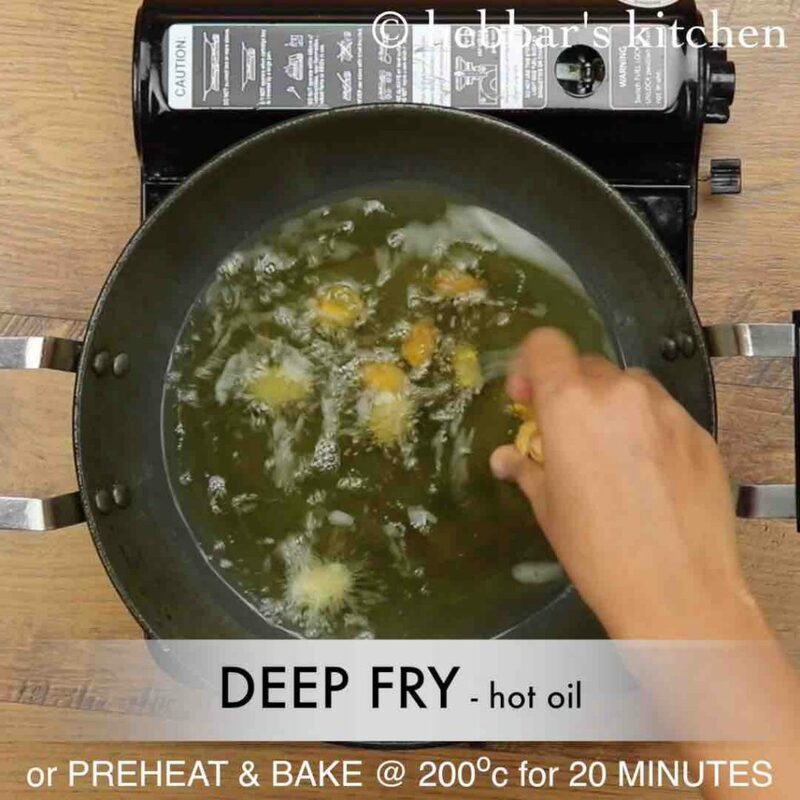 firstly, adding corn flour is optional, however, it makes besan coating crisper. 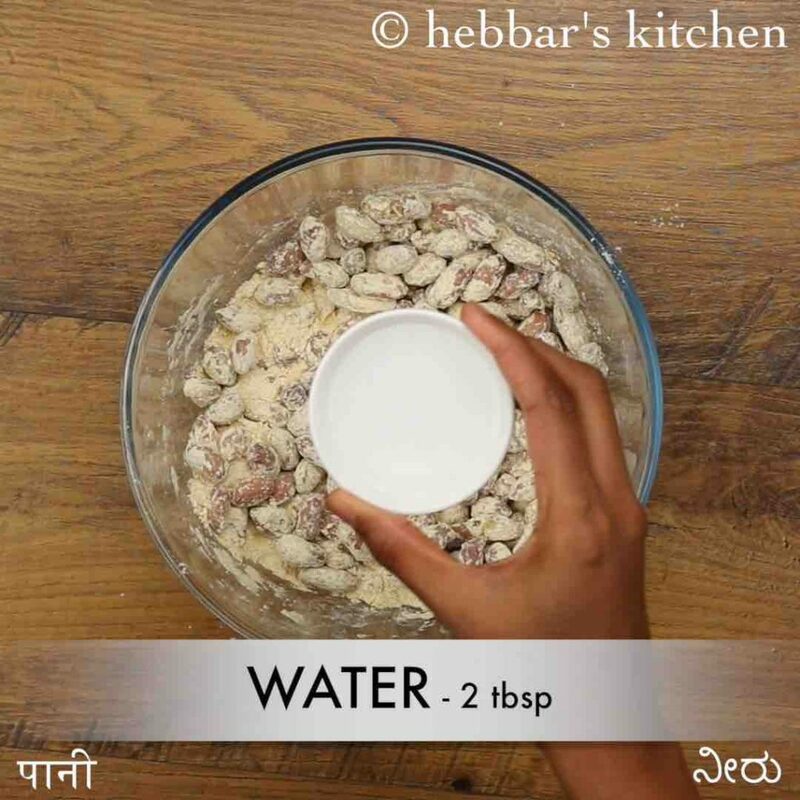 also, the same recipe can be used to make masala cashew or masala almonds. additionally, add a drop of red food colour for bright red colour in masala peanuts. 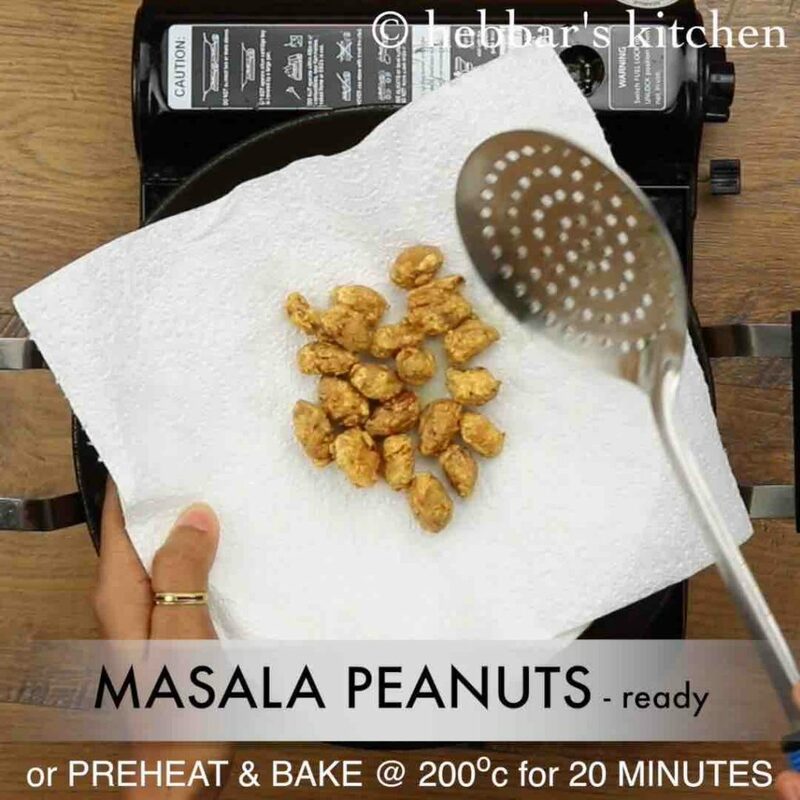 finally, fry the peanut masala on low flame for more crunchy bites.